An ordinary user, who wants a powerful and yet an easy-to-set-up website might choose Joomla!. He or she is not a specialist in security, either good security or bad security. He or she is merely a target to be taken down. While Joomla! itself is inherently safe but misconfigurations of the CMS, vulnerable components, hosts that are poorly configured, and weak passwords can all contribute to the downfall of your site. Users are redirected to unknown domains. Fake advertisement sites served to the visitors. The site may try to install malware on the user’s device. The site may get blacklisted for serving spam. Fake phishing pages appear on the site. Especially on the payment pages. One after the other multiple pop-ups may appear. Joomla malware redirect leaves web admins baffled all over the internet. Often, the first reaction is to take help from the Joomla community forums. Sometimes the Joomla redirect hack returns back even after cleanup. Some examples of such cases are given below. Your website infected by Joomla redirect hack? Drop us a message on the chat widget and we’d be happy to help you. Fix my Joomla website now. Tampering Hosts File: Each computer contains its own Hosts.txt file. This file helps them to translate hostnames to corresponding IPs. A large-scale malware attack can tamper the hosts file of the computers. These computers would then redirect to the attacker-controlled domain instead of your Joomla site. Thus conducting a Joomla malware redirect. Attacking the DNS Server: DNS is a pretty old protocol, therefore, the whole system relies on trust. The DNS server communicates via slave and master servers. The master transfers zones to the slave servers upon request. The DNS zones are basically a copy of the local database. This contains sensitive info about the machines that may not be publicly visible via search engines. Thus, the attacker sets up a rogue slave server and obtains a copy of the zone. Using this info, the attacker tries to attack vulnerable machines and compromises the network. Moreover, the attacker can then tamper the local DNS server. Therefore all the queries then redirect to the attacker-controlled machine. Thus successfully accomplishing a Joomla redirect hack! Moreover, these attacks can be conducted on a LAN network at public wifi too. The attacker may set up a fake DNS proxy. This would resolve the IP of your Joomla site to the attacker-controlled machine. Thereby tricking all the local users to redirect to the fake Joomla site. Thus accomplishing a Joomla redirect hack! <meta http-equiv="refresh" content="2; url=http://attackerDOMAIN.com/ ">. These files redirect users using the Meta tags. The visitors are redirected toattackerDOMAIN.com. It is noteworthy here that sometimes the Joomla site may be vulnerable to Stacked Based SQLi. This gives the attacker the ability to execute system commands. The attacker can, therefore, infect the files with malicious redirect code using SQL statements only! XSS is a close friend of SQLi when it comes to commonly found vulnerabilities. A whole bunch of XSS vulnerabilities was uncovered in Joomla this year. These include CVE-2018-15880, CVE-2018-12711, CVE-2018-11328, CVE-2018-11326. The most serious one among the list was CVE-2018-12711. This was caused due to a faulty ‘language switcher module‘. This allowed the URL of some languages to be infected with JS. Using XSS, an attacker can perform other attacks like stealing cookies, apart from making Joomla malware redirects. If the site displays a message box saying ‘Hello World!’ then the site is vulnerable. 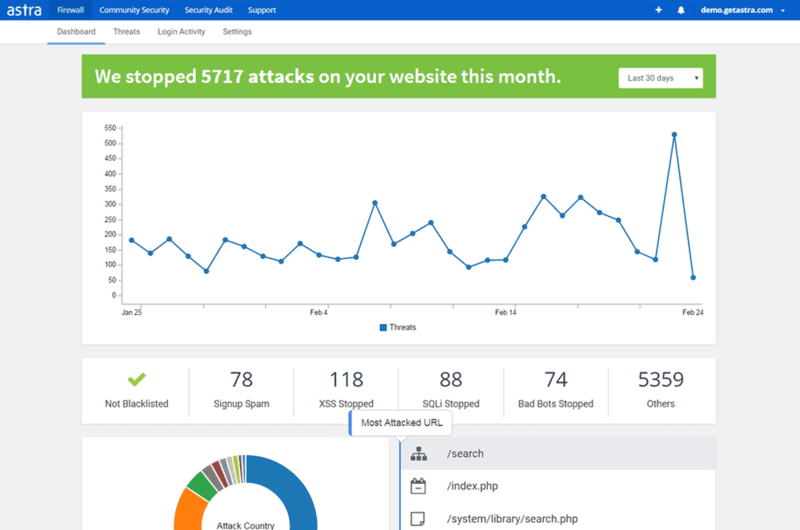 From here on, the attacker can manipulate the site in multiple ways. For example, the attacker can add fake URLs to a particular field of the form. Need professional help in securing server after Joomla redirect hack? Drop us a message on the chat widget and we’d be happy to help you. Fix my Joomla spam email now. The final line in this code snippet redirects the users toMaliciousDomain. This is accomplished using the scriptredirect.php. Apart from .htacces, files like index.php are also commonly infected. As index.php is the first-page user lands on, it contributes to a significant amount of user traffic. The attacker, therefore, trie to compromise index.php to divert maximum traffic. This diverted traffic, in turn, helps the attacker to harvest clicks. Consult Astra security experts now for immediate Joomla redirect hack malware clean up. Our powerful Firewall safeguards your website from XSS, LFI, RFI, SQL Injection, Bad bots, Automated Vulnerability Scanners, and 80+ security threats. Secure my Joomla website now. Restrict the zone transfer to a bare minimum. Predefine all the slave DNS servers so that no rogue slave can request zone transfer. This can be done by editing thenamed.conf.local file. For example look at the image given below. This piece of code predefines the slave DNS servers i.e.secundario01 Therefore allowing zone transfers to trusted servers only. Sometimes, DNS servers are also used in data exfiltration attacks. So monitor data packets passing through DNS servers in real time. This can be accomplished via handy tools like Wireshark. When the code responsible for Joomla redirect hack is hidden within core files, it becomes difficult to detect. Although there is something common in all the infected files. That is the malicious code responsible for redirects. All such files can be searched in one click by using a database admin tool like PhpMyAdmin. For instance look at the image given below. Check for new admins and remove them. Rolling back the changes in case the attacker has damaged the database. Often web admins allow third-party ads on the site to gain some revenue. However, some of the ad networks do not play by the book. The leniency in serving ad content allows malicious players to inject redirect code within the ads. Moreover, most of the malicious scripts are hosted on the other server which further complicates the matter. If infection reoccurs after cleaning, again and again, try blocking the ads. In case the Joomla redirect hack stops then it was likely due to malicious ads on the site. Therefore, contact the ad network and resolve the issue. Updates contain key security fixes which can be verified from the changelog. Therefore update regularly to keep Joomla secure. Use reputed extensions only. Avoid using null or poorly coded extensions. Apart from core files, keep your extensions updated too. Secure credentials can minimize the chances of a brute force attack. Secure the file permissions for the server. Ensure that permission for files like .htaccessis set to444 (r–r–r–) or440 (r–r—–). In case you suspect a file modification, login via SSH. On the terminal, execute the following commandfind /path-of-www -type f -printf '%TY-%Tm-%Td %TT %pn' | sort -r. The output obtained would be the list of files modified according to their respective timestamps. From here on manually inspect the files. Comment out the suspicious lines of code using the character ‘#‘. Thereafter consult the experts for a file evaluation! It is important to ensure that Joomla redirects hack doesn’t reoccur. However, the hackers may be constantly targeting the site. In such a scenario the most effective defense mechanism is using a firewall. Integrating a firewall is pretty easy and convenient. Security solutions available in the market today are easily scalable. Like the one at Astra which is perfect for small blogs as well as for large shopping sites. Moreover, Astra notifies the users via email whenever any file is modified. Astra has a great track record when it comes to blocking Joomla malware redirects. Also, the packet filtering deployed by Astra ensures that no bad request by the attackers harms your site. Moreover, Astra conducts a security audit of your Joomla site and notifies you in case any vulnerability is detected. Thereby keeping you a step ahead of the attackers. A perfect amalgamation of human support and automation, Astra is highly recommended to block Joomla redirect hack. Previous PostMagento, OpenCart & Prestashop Website Infected with SEO Spam? Next PostWordPress Account Suspended Because of Malware. How to Fix Account Suspension by Host? Very good article. I found the hacker files and checked the .htaccess file for a redirect but missed the search refer lines. I went back after reading your article and found them right at the top of the file. Thank you for sharing this information!